This document is intended for application developers and database administrators who plan to migrate an Oracle Database to Microsoft SQL Server. In its documentation, Microsoft takes the official Oracle HR schema. It seems to work like a charm and with no conversion work. What would it be with a more concrete example? For this test, we will use a free and open source load testing tool called “HammerDB”. It can connect to both Oracle Database and SQL Server. In short, this tool is a benchmarking tool that creates and uses a database schema and a set of databases objects to do its job. As, we previously created a user called SSMAUsr and its associated schema in our source instance (in contrast to SQL Server, in Oracle Database, there is only one schema associated to one database user), we will take and use it as a destination for HammerDB objects. 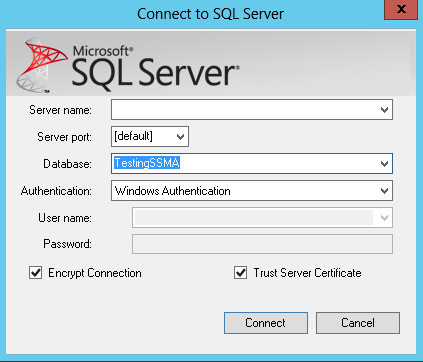 We will then run SSMA against the SSMAUsr’schema and try to migrate it to our destination SQL Server instance. Once the migration process is complete, we will run HammerDB against that migrated schema and check if the application works. Go to HammerDB website and download the installer. Once the download is completed, go to the computer on which SSMA has been installed and run the executable file. You could get following warning message. If so, click on “Run”. Note: For HammerDB to be able to connect to an Oracle Database instance, it needs the Oracle client to be installed. Once HammerDB installer is started, you will provide the language in which the tool will be installed. Select the appropriate language and click on the “OK” button. Click on “Yes” button and the installation wizard will be displayed. Select the appropriate destination folder and click on “Next” button. Click on “Next” button and the installation begins. And, finally, HammerDB is installed. Click on “Finish” button and HammerDB will start. Note: If anything went wrong during the installation or the remaining of this procedure, please, refer to HammerDB documentation. It’s the best resource for getting support. For those who are interested in the kind of benchmarks HammerDB can perform, you can go to Options menu and click on “Benchmark”. For the purpose of this test, we will keep the default, which is Oracle and TPC-C option. Let’s now adapt the SSMAUsr database user on source instance so that it can be used for this test. First, let’s grant it the permission to create objects and data. The previous command creates a tablespace called SSMA_DATA with one datafile with an initial size of 2 Gb and extensible by step of 128Mb to 16 Gb. For testing purpose, let’s create a simple table and check that the object is located in the SSMA_DATA tablespace. You should get SSMA_DATA as a result. Now, we can drop the table we just created. In this subsection, we will create the schema objects using HammerDB. We will start by editing HammerDB configuration by double-clicking on “Option” item in the “Schema Build” tree item. This will result in the display of a dialog where we can change connection settings as well as other aspects. Once the configuration is done, you can hit the “OK” button and click on the “build” item, just under the “Options” on which you just clicked before. You will be prompted to accept the actual building of the HammerDB schema. You could notice messages about the failure of user creation or tablespace creation, but you can ignore it as we prepared all the work before the execution. Normally, after a while, you should get a view similar to the following one. And if we run following query, we should get a list of all the objects HammerDB has created. Now, we can close HammerDB as we won’t use it anymore. In this section, we will focus on the preparation for actual migration and check what objects can be migrated directly and which one requires code conversion. First of all, we will start SSMA and create a new project with the options specific to this step, as explained in a previous section. The first step when preparing a migration is getting an overview of the work that has to be done. We can do it thanks to a “Create Report” menu item in the contextual menu that appears when clicking on the source schema SSMAReport. It will actually build an HTML report and propose to open it up with Internet Explorer or your default web browser. If we display the report, we can see that, unfortunately, or expectedly, we can’t migrate the schema directly to SQL Server. But, good news though, almost 98% of the schema is directly transferable. Schema and procedures are the objects that require some roll up our sleeves. Now, if we look at the left-hand tree, we can expand the “Procedures” node and learn that problematic procedures are DELIVERY and NEWORD. Once it’s done, click on “Connect” button. Don’t forget to use a SQL Server login that is a member of sysadmin role. Now, if we selected the SSMAUsr schema in Oracle Database Metadata Explorer and if we right-click on it, the “Convert Schema” button in the contextual menu will be enabled and ready to use. The conversion will directly start and we can monitor the evolution of the conversion via the Output window at the bottom of SSMA. If we go to SQL Server Metadata Explorer, and right-click on the TestingSSMA database, a contextual menu will appear. We should click on “Synchronize with Database”. We can see that the conversion created two .NET Assemblies, the ssma_oracle schema we talked previously and the SSMAUsr schema we are trying to migrate. If we hit “OK”, the metadata explorer will be updated with the data displayed in the screen capture above. A quick look at the stored procedures of the SSMAUsr schema in SQL Server metadata explorer will highlight the fact that the conversion also imported the two problematic stored procedures. If we export let’s say the DELIVERY stored procedure as a script, which is done by right-clicking and hitting the “Save as Script” of the contextual menu, we will notice that the SSMA added some comments during the conversion. The generated code does not have any “;” at the end of the T-SQL instructions. The generated code is indented using a 3 spaces basis. In order to be able to actually migrate the application, we have to fix the code for DELIVERY and NEWORD stored procedures and keep a close look at the source stored procedure. In some cases, it could be simple changes, in other cases, a complete code rewrite should be made. We won’t go any further in the SP code conversion because it won’t give any additional value to the content of this article. Once the data migration is complete, a report dialog is displayed with the ability to store the report to disk. We can check the content if we want to ensure that the no bad conversion occurred in text or dates columns and some other tests for consistency. You will find attached the converted stored procedures that I have modified and were highlighted by SSMA and the PAYMENT stored procedure where I had to change every OUTPUT parameter definition with a “= NULL”. I finally got the following message which tends to tell me that SSMA is not yet well designed for code conversion. I stopped the conversion process at this point because it does not fit any real-life need and would be a waste of time for me. First, create a HammerDb SQL Login on destination SQL Server instance, which has access to all objects in SSMAUsr schema so as ssma_oracle schema. For simplicity, you can add the database user mapped with HammerDb login as a member of the db_owner database role. Once the HammerDb user is created, in HammerDB application, create a new project and set the benchmark option to “SQL Server” with “TPC-C”. Once done, go down to “Driver Script node in treeview on the left-hand pane and double-click on “Options”. This will open a connection description dialog. Edit the information in that dialog and click “OK”. Then, click on “Load”. It will load a script that will be executed by virtual users. The last step is to create virtual users and make them run. Note: I used a case-sensitive database and failed to run HammerDB, so if there is one advice to give, it’s to use a case-insensitive database or to adapt the object and column names according to the code. The SSMA tool is pretty handy when it comes to converting Oracle databases tables and transfer data easily. It has advanced customizations that we did not cover in this article like schema mapping. However, you cannot use it blindly and imagine the migration will be fine. A complete code review and advanced testing of client applications are mandatory as it’s quite a complex change. Another interesting point would be to compare performances between a migrated schema using SSMA and the same schema but specifically designed for SQL Server. Anyway, I would suggest investigating the tool in depth to see all its capabilities and to stay tuned for new versions. Living in Belgium, I obtained a master degree in Computer Sciences in 2011 at the University of Liege. I'm one of the rare guys out there who started to work as a DBA immediately after his graduation. So, I work at the university hospital of Liege since 2011. Initially involved in Oracle Database administration (which are still under my charge), I had the opportunity to learn and manage SQL Server instances in 2013. Since 2013, I've learned a lot about SQL Server in administration and development. I like the job of DBA because you need to have a general knowledge in every field of IT. That's the reason why I won't stop learning (and share) the products of my learnings.